Here's another novel that could be really good or really not good. What do you think? They were the children of France’s most celebrated men of nineteenth-century letters, the celebrity heirs and heiresses of their day. Their lives were the subject of scandal, gossip, and fascination. Léon Daudet was the son of the popular writer Alphonse Daudet. Jean-Baptiste Charcot was the son of the famed neurologist Jean-Martin Charcot, mentor to a young Sigmund Freud. And Jeanne Hugo was the adored granddaughter of the immortal Victor Hugo. As France readied herself for the dawn of a new century, these childhood friends seemed poised, more than most, for greatness. 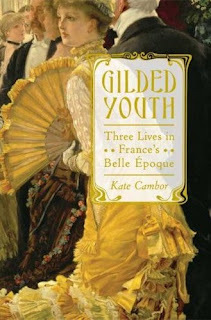 In Gilded Youth, Kate Cambor paints a portrait of a generation lost in upheaval. As France weathered social unrest, violent crime, the birth of modern psychology, and the dawn of World War I, these three young adults experienced the disorientation of a generation forced to discover that the faith in science and progress that had sustained their fathers had failed them. With masterful storytelling, Cambor captures the hopes and disillusionments of those who were destined to see the golden world of their childhood disappear—and the universal challenges that emerge as the dreams of youth collide with the reality of experience. Not sure about that one?? A lot of disillusionment in this one, it sounds like. Could be very interesting though. I have seen this cover somewhere before - a Tasha Alexander book? I'm sure that you'd like this one. It certainly looks like my kind of book. I love that era! Thank you for finding it for us.